and D. Van Pelt's copy of The Charter of the City of New-York, With Notes Thereon. Also a Treatise on the Powers and Duties of the Mayor, Alderman, and Assistant Aldermen, and the Journal of the City Convention, New York, 1836. 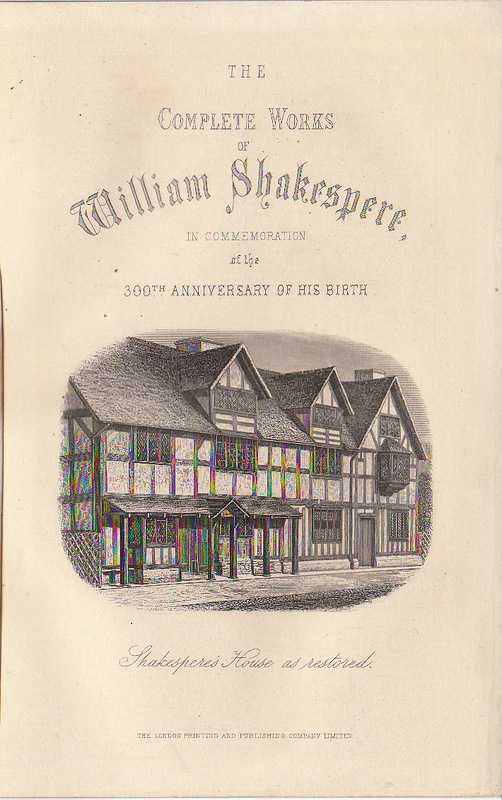 I bought the Shakespeare book because I wanted a book formerly owned by Paul Leicester Ford for my Sentimental Library Collection. 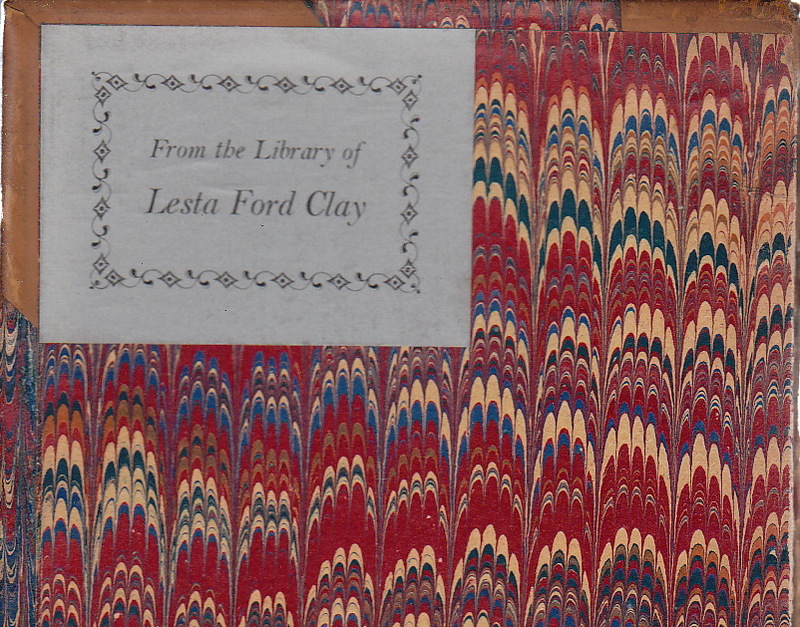 I already had eight books written by him, and one book by his brother, Worthington Chauncey Ford. The Shakespeare book was inexpensive because it was a hurt book, and because it was an odd volume of a three-volume set. Both boards were completely detached. 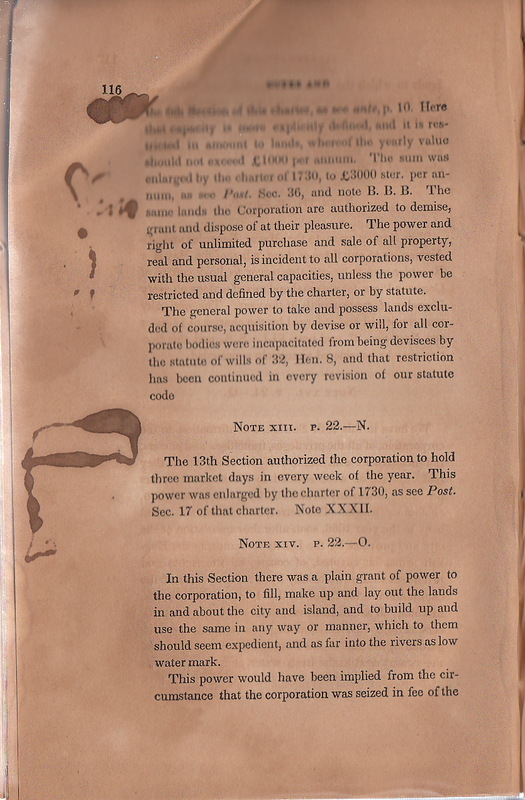 The first signature containing the front endpapers, frontispiece, title page, and table of contents, was completely detached. And three quarters of the leather formerly covering its spine was lacking. Paul Leicester Ford was born in 1865. He was a small sickly boy who wore a back brace because of a spinal deformity. He never grew over five feet tall. 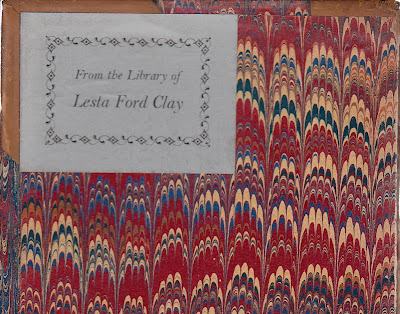 His father, Gordon L. Ford, had the best Americana Collection in the world: 100,000 manuscripts and 50,000 books. As a teenager, Paul established the Historical Printing Club together with his father and Worthington, publishing various tracts and pamphlets from his father's collection. As an author, he made many contributions to history, from The Writings of Thomas Jefferson, 1892-1899, to the Franklin Bibliography, 1899. Switching to fiction, his novel, The Honourable Peter Stirling, 1894, became quite popular. 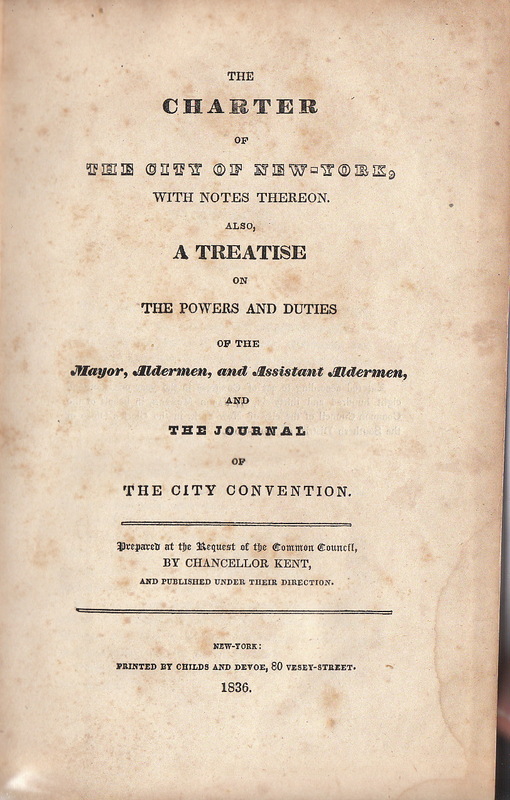 Unlike knowing Ford, I didn't know the owner of the New York City book from Adam. I bought the book for my small but budding New York City Collection. It was inexpensive because it, too, was a hurt book. Its front cover was completely detached. The scotch tape which once held the cloth to the spine was long gone, along with the cloth, leaving the spine exposed. Kleinteich's bookstore was previously located at 334 Bedford Ave. Brooklyn until sometime in the 1890s. When I researched Van Pelt, I discovered that he bought the book for his own New York City Collection. Daniel Van Pelt was born in the Netherlands in 1853, graduated from the College of the City of New York in 1874, and from the Theological Seminary at New Brunswick in 1877. He was the pastor of the Remsen Street Reformed Church, one of the most prominent churches in Astoria, but resigned his position in 1898 to devote more time to writing. 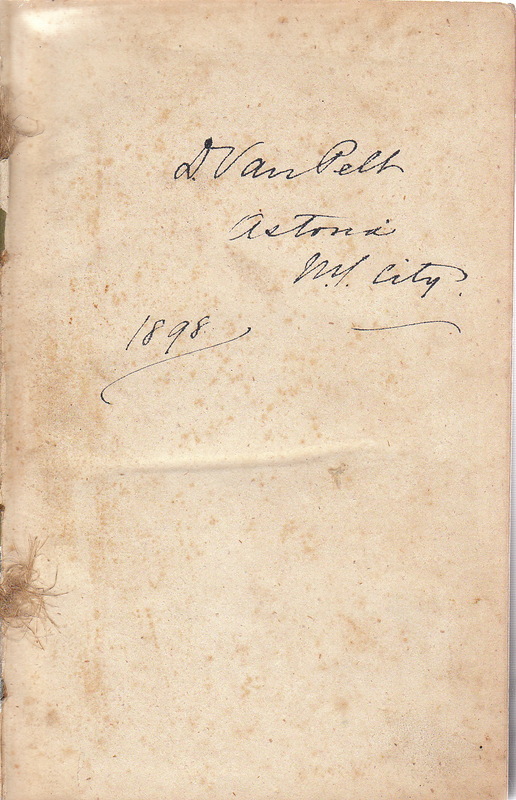 He was an acknowledged expert on early Dutch history in America, and in New York City history, publishing articles and books on both subjects, including the massive three-volume work, Leslie's History of the Greater New York, New York, 1898. Weather permitting, Daniel Van Pelt enjoyed taking a midnight bath in the East River near his home in Astoria. But on the night of Tuesday, Oct. 23, 1900, he never made it home. He drowned. They found his clothes the next morning folded neatly on Scaly Rock, Hell's Gate, Astoria. His body washed up on the shore in Bay Ridge, Brooklyn the following Monday. Dead at the age of forty-seven. According to one newspaper report, Van Pelt's wife, Gertrude Scott Van Pelt, was devastated by the news, and was contemplating suicide. But the hurting didn't stop there. Van Pelt's only son, Leonard Irving Van Pelt, died the following year on his sixteenth birthday, Dec. 14, 1901. 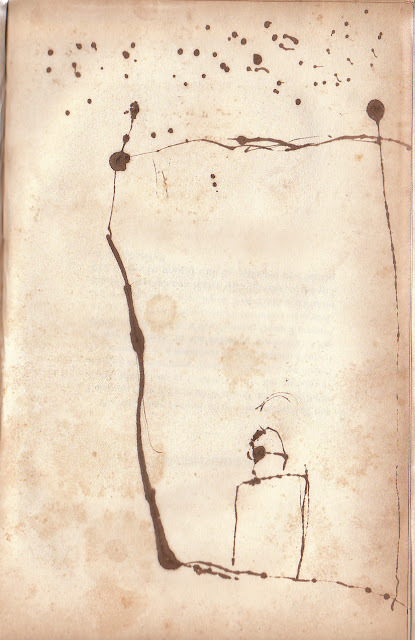 Was it Leonard who doodled on the page below? Is this a drawing of his father drowning? Paul L. Ford did not have a long and healthy life either. He had another brother, Malcolm Webster Ford, who was one of America's best-known athletes. 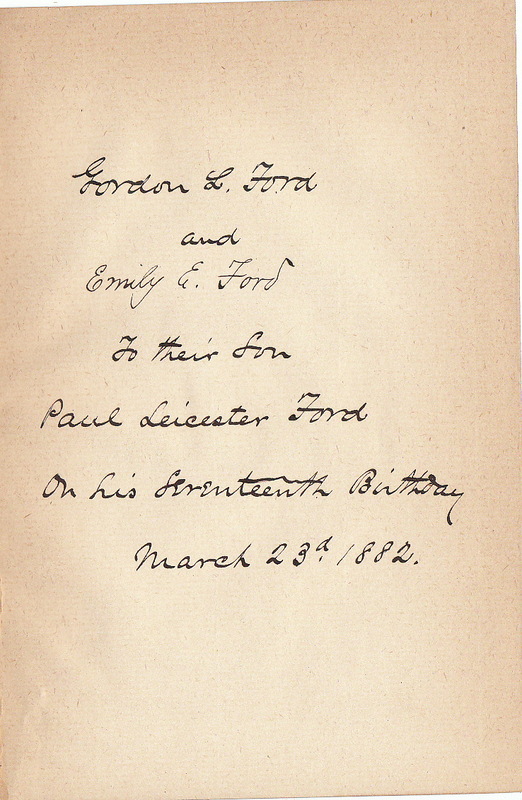 Gordon L. Ford wrote this son out of the family will because of his flamboyant lifestyle. Gordon L. Ford died of Typhoid Fever while nursing Malcolm in 1892. At the inheritance trial instigated by Malcolm two years later, Paul L. Ford said of his father, "He gave a worthy life to save an unworthy life." For years afterwards Malcolm argued that his brothers cheated him out of his inheritance. Finally, on May 8, 1902 Malcolm entered Paul L. Ford's library and murdered him. Shot him dead at the age of thirty-seven. Then Malcolm killed himself. Two hurt books. Two sad stories. I had always intended to fix these two hurt books, but after researching the stories of their former owners, I'm thinking of leaving them in their current condition.